What kind of music Sol Skugga and her latest work, Fairytales and Lullabies, may be is open to some interpretation. However, I do know two things. First, it really doesn't fit our review criteria. This work is some eclectic mixture of folk, pop, dance, and electronica. As a vocalist, Ms. Skugga (not her real name, of course) fits in the same field as Tori Amos, Amy Lee and, loosely maybe, Kate Bush. 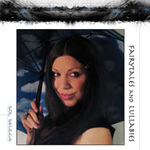 Fairytales and Lullabies shows her impressive song craftsmanship and musicianship throughout. A self-confessed studio rat Sol depends heavily on production and collaboration with other artists including Staffan Osterlin, guitarist for ex-Iron Maiden vocalist Paul DiAnno. Her music is certainly novel and appealing if you're into the aforementioned styles and artists, which leads to my second observation. I don't normally look for, listen to, or generally care about this type of music or the associated artists. Therefore, I'm a reluctant to comment on Ms. Skugga's material. I would normally skip this sort of thing. Nevertheless, suffice it to say this: without doubt Sol Skugga is quite talented and her music is finely crafted and well-produced with Burn Her, I Wanna Know, and Quietly Crucified being noteworthy songs. Recommend Fairytales and Lullabies to your girlfriend or your favorite art gallery or cafe. Without doubt Sol Skugga is quite talented and her music finely crafted and well-produced with Burn Her, I Wanna Know, and Quietly Crucified being noteworthy songs. Recommend Fairytales and Lullabies to your girlfriend or your favorite art gallery or cafe.